Then my DH has a business friend who had their first child. They had a little boy and since the dad is a Baylor graduate, my DH wanted me to make something in Baylor colors. So I found this pattern called All Season Baby Throw. It goes super fast. I made it with I Love This Yarn, mainly because that is the washable WW yarn that you can get in the widest range of colors and with trying to match Baylor's colors that came in handy. 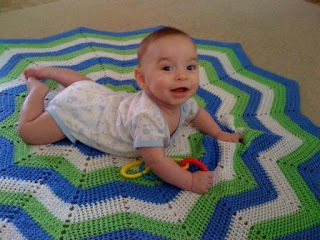 That pattern went so fast, that when my Mama asked me to make an afghan for a Church friend's new Grandson, I dug out some more stash yarn, Simply Soft and made this one up in some happy boy colors. She asked for this one with a really short deadline, so I told her she didn't get to pick the pattern, lol. She really likes the Lyn's Round Ripple pattern and usually wants me to make that one.